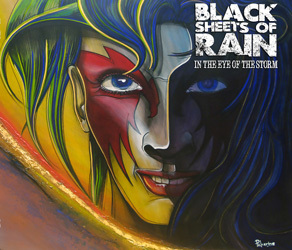 With a name taken from a Bob Mould album – “one trick I’ve always found that’s worked well is looking through albums for song titles,” suggests Rich Davenport – Black Sheets Of Rain have been together since 2016, the band being made up of guitarist / lead vocalist Davenport, bassist Matt Lambourne (formerly of Solomon Groove) and drummer and occasional lead vocalist Dave Nuttall who previously played with the Toy Dolls. “Rumour has it he knows exactly where Nellie The Elephant trumped off to, although he refuses to spill the beans,” quips Davenport, alluding to the band’s novelty hit of 1983. Based in Lancaster, the band have just released an extremely exciting EP entitled ‘In The Eye Of The Storm’ on Austrian label W.A.R. Productions. “The EP was recorded in two sessions,” says Davenport, “one in November 2017 and one in November 2018. The songs had really started flowing once Matt joined the band. What usually happens is that one of us will bring in a rough structure for a song, say a riff, a verse and a chorus, and then we jam on the ideas, take them away and work on them, then come into rehearsal again and put the parts together. Matt’s basslines are very melodic, and blend with the guitar riffs, and Dave is a very tasteful drummer, in the sense that he can let rip with impressive fills, but plays to fit the song, so there’s patterns and structure in the drum parts. And with us being a power trio, it anchors the sound. Dave also has a great ear for arranging songs. When we were working on ‘Through The Storm’, Dave suggested some changes which really brought the song together. “Once we’d worked up the material, I contacted Tony Wilson, who runs Total Rock Radio, a station on which I used to DJ. You’ll no doubt remember Tony from his role as producer of Tommy Vance’s legendary Friday Rock Show, and he also produced many of the famous sessions for John Peel. As we were self-funding the recording, and needed to get results within the limited amount of studio time our budget allowed, I thought that Tony would be the ideal producer because he’d specialised in getting a great sound for so many bands in a short space of time for all those sessions. And that’s exactly what he did for us. As mentioned earlier, the band have been together for the best part of three years, although its roots stretch back a lot further. “Dave and I have known each other for about twenty years, and we started jamming around 2012. We both like metal, classic hard rock, and crossover stuff like Suicidal Tendencies, so we have a lot of common ground, but the other side of that particular coin is that it took us a while to determine which of those areas to focus on!” he laugh. “We initially wrote a mix of songs that were more influenced by bands like AC/DC and UFO along with others that were more straight-ahead metal. I’d previously played mainly in old school metal bands, so the material we had in that vein felt like a more natural fit, and Dave had also commented that he thought those songs worked best. When Matt joined in 2016, his influences were much more in line with that too, both as a player and a songwriter, and our sound just came together, focusing on the heavier side of things. Two of our biggest influences are Judas Priest and Black Sabbath, and both of those bands cover the whole spectrum of metal, from doomier tracks through to fast numbers that pre-empted thrash, and that inspired us to try to include a range of moods and tempos in our songs. “Obviously,” he continues, “with ‘In The Eye Of The Storm’ we were hoping to make a strong first impression and show the range of our material. With that in mind, there are two fast songs, ‘Still Spark Something’ and ‘Force Of Habit’, a mid-paced track, ‘Through The Storm’, and two in swing tempo, one of which – ‘No Rest’ – has a Sabbath-inspired doom feel to it; so hopefully people will enjoy the variety. We also wanted it to be a good representation of our approach to heavy metal, which is to make music influenced by old school metal that hopefully sounds like it was recorded today – not jumping on any bandwagons, but not sounding like a throwback either. Tony Wilson really helped with that. He’s carried on producing since leaving the BBC and he’s up-to-date with contemporary studio techniques so helped us achieve what we were aiming for. And it’s also part of our sound in general, in that we sometimes use drop D tuning, which adds a little extra heaviness to the sound, although it’s not a new concept: Tony Iommi was doing it with Sabbath in the early Seventies! Talking of ‘No Rest’, that particular track features a mutual friend in Tony Dolan, who delivers the spoken word section. “Tony and I are old friends. He came along to the Phil Lynott tribute show I mentioned earlier, and sang ‘Cold Sweat’ with the band I was in at the time, See Red. Then in 2011, when he was putting a new line-up of Atomkraft together to play a show supporting Helstar in London, he asked me to play guitar. I was honoured to do it. Atomkraft were such an underrated band – part of the NWOBHM, but also one of the UK’s first thrash bands. When we were working on ‘No Rest’ in rehearsal, and Matt had written the spoken word section in the middle, I immediately thought of Tony, because he’s also an actor – he starred in ‘Master And Commander’ alongside Russell Crowe. And I also remembered he’d done a spoken word introduction to ‘Future Warriors’ with Atomkraft. He kindly agreed to do the section on ‘No Rest’ in a break between tour dates with Venom Inc, and met up with Tony Wilson in London for the recording. Those guys have known each other for years too, so they were glad to meet up, and Tony D absolutely nailed the spoken word section, sounding suitably nefarious. Although the album is lyrically quite varied – and extremely interesting – Davenport points out that “apart from ‘No Rest’, the songs are all about surviving the rough stuff in life, although we always try to keep things hopeful in the lyrics. ‘Through The Storm’ is a song I originally wrote in the Nineties, but it came to mind a few years ago when my wife had a serious incident, nearly died, and was hospitalised for four months. The song is about sticking with each other no matter what. ‘Still Spark Something’ is about a near-fatal asthma attack I had in 2016, which was pretty scary. I couldn’t breathe through my lungs at all, and was having to use the breathing technique I use for singing, which is from the stomach and diaphragm. Thankfully the ambulance team arrived just in time, and the song is about being thankful for the people who were there for me as it was happening and afterwards. ‘Force Of Habit’ was an idea of Matt’s, comparing the idea of a toxic relationship that someone is struggling to leave with an addiction. And I wrote the lyrics for ‘Weight Of Shadows’ after Robin Williams died; I was a huge fan, and I’ve had battles with depression myself over the years. The verses are trying to describe what depression can feel like, and the chorus is the voice of a friend talking to a person suffering with depression and feeling suicidal, offering to stay with them till it passes. The song is coming out as a single for a charity that helps people who are struggling with depression, and also helps people who’ve lost a loved one to suicide, called Ian’s Chain.” The website is www.ianshain.co.uk .